Your blueprint is designed as to the change you are committing to—perhaps altered a bit already based on the evaluation and work of the past week (Netzach and overcoming obstacles). Hod literally means to acknowledge and in the context of change a need, to be honest about what you accept as is and surrender to it. What is meant by surrender? Surrender is not giving up or giving in—it is giving way. Each of us has a plan for our path to growth/change. Yet, the path is never without some accommodation, and at times with simple surrender. Obstacles when not overcome, need to be accepted—surrendered to. This spiritual realization is the essence of Hod—to realize our human limits and give way to the flow. Ultimately this relates to the inevitable acceptance of mortality—the surrender to death. 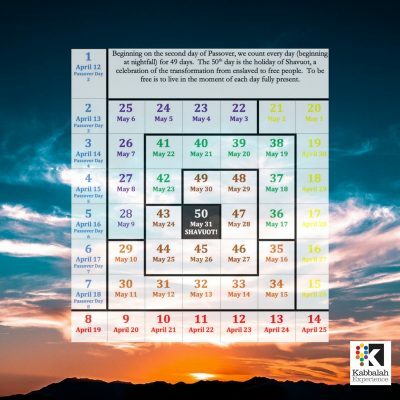 In this week Hod in Hod is highlighted as the 33rd day of the count—the day on which the 1st century Kabbalah master (Shimeon bar Yochai) clarified on his death-bed to celebrate the ascension of his spirit. On their continuing journey in the desert, the former slaves face another crisis—lack of food. Enter the manna—a nutritional miracle that required surrender to what they could not overcome. They also adopt a day to rest—to signify that while effort needs to be exerted we also benefit from acknowledging the need to let go—to inculcate within us the need to step back from our efforts and recognize the value of accepting limits and giving way. Still keeping Chesed-love (of myself and others) at the forefront of the motivation for change. I am not aiming for perfection—aiming though for overall consistency. Hod is a reminder that I might surrender for the moment due to recognizing my own or others’ limitations and that the answer to a prayer may be “no” in part or in whole. Gevurah is self-determination. Today it is time to limit your acceptance, to say—I am limited but I am determined. With full awareness I can say—“this is what I am capable of now” or this is what the situation warrants. When one door closes though another may open. Take out the blueprint and look at it in light of accepting the limitations you have reflected on for the past two days. Can you acknowledge that it is a challenge to let go of some aspects of the blueprint? Today I must come to peace with altering the plan, the blueprint needs tweaking and I need to be cognizant of what I can and cannot change—for now. I can also consider that this can lead to taking a different path that may be more useful. Can I overcome the need for overcoming? Just surrender. Netzach here is subordinate to Hod. Sometimes our plans and the vision of our blueprint depend on knowing that we can act, that we can and will overcome. If you now realize that your blueprint has changed you need to overcome your desire to not surrender—and embrace the surrender. This is your new path. Today is called Lag Ba’Omer—the 33rd day of the Omer. Fully accepting our limitations is the release we experience today. We reflect on death and recognize how it affirms not only our living, it also affirms that with every limit there is also a freeing up toward new possibilities. For each week’s Sefirah you ask yourself have I done the inner work needed to acknowledge my limits and to implement my (evolving) blueprint for change? Yesod is to be in integrity with the challenges of wanting greater or faster change and admitting limits and accepting the change that is possible now. I may surrender to the precise goals of change but I can see that change brings more change with it. What will manifest for now is a resolution between the active and passive roles of trust. Our plans are not just our own. We live in relationship with others and the world and while we can be powerful agents we also know the secret of surrender—accepting what is or is not possible in the moment. When we surrender we may find more than we expected because a vessel empty of expectation has more capacity to be filled fully—to be fulfilled.